Hunters' lore describes Mummy mice as completely invulnerable. These undead mice ache to overrun and enslave the land they inhabit. A hunter will certainly need to be well prepared in order to face this enemy. The Mummy Mouse is attracted to Moon Cheese, Radioactive Blue Cheese, and Undead Emmental in the Catacombs and Mousoleum locations. The Mummy Mouse will not be attracted to Ancient Cheese in the Catacombs location. No Charms are required to attract the Mummy Mouse. The Mummy Mouse drops Stale Cheese in the Catacombs location. The Mummy Mouse is not known to drop any loot in the Mousoleum location. Attraction info and special event loot drops for the Mummy Mouse can be found at the individual event location pages. The Mummy Mouse drops the Haunted Egg during the annual Spring Egg Hunt. 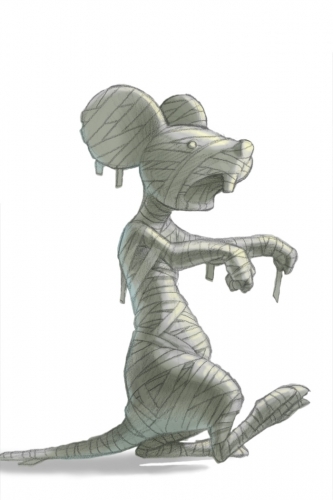 21 July 2008: The Mummy Mouse was released. 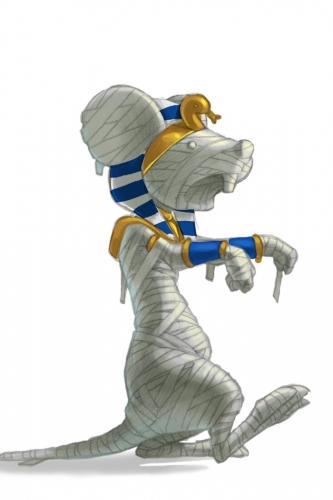 An image of the Mummy Mouse can be seen on the Mousoleum header image. Hunters' lore describes these mice as completely invulnerable. These undead mice starve to enslave and take rule over the land they inhabit. A hunter will certainly need to be well prepared in order to face this enemy.